The BSc (Hons) Strength and Conditioning​ is just one of an exciting range of courses on offer at the University of Wolverhampton’s Institute of Sport and Human Science. Why not come and visit us at one of our Open Days. You will begin the course by learning about the core sciences, physiological functions of the body during/in response to training, and applied functional anatomy & movement. By the end of the programme you will have developed competencies in designing and planning sessions, delivering Strength and Conditioning coaching sessions, communication skills, and health & safety principles. You will be taught by academic staff who are at the cutting edge of their fields. Our staff are active researchers who publish text books and peer reviewed journal articles. Our staff don’t just teach from text books, they’re the people who write the text books! Andy Lane, Professor of Sport Psychology. Andy has authored more than 200 peer refereed journal articles, given numerous keynotes talks, and is on editorial boards of prestigious journals in sport sciences (Journal of Sports Sciences), Sports Medicine (Journal of Sports Science and Medicine), psychology (Personality and Individual Differences) and education (Journal of Hospitality, Leisure, Sport & Tourism). He has edited five books including the book Case Studies in Sport Science and Medicine), a co-authored work with Prof Greg Whyte, and his recent book on sport psychology and nutrition in running, co-authored with colleagues at the University. Professor Lane is regularly asked for comment on TV, radio, websites and newspapers. For example, he worked with Adidas on videos with Glenn Hoddle and Mathew LeTissier on penalty taking (see video 1 and video 2 for example). He has also led high profile research projects such as the BBC Science Lab “Can you compete under pressure?" project fronted by former Olympian Michael Johnson. Mark Niemz has worked in the area of athletic development since 2005 after completing his MSc in Strength and Conditioning (S&C) at the University of Edinburgh. Since then he has been involved as a practitioner in the physical preparation of athletes within a number of settings, including working with world class high performance sports programmes as an S&C Coach with the English Institute of Sport, and working with talented student-athletes in school and university environments. Mark is an accredited coach and member of the UK Strength and Conditioning Association, and continues to practice as an S&C coach and consultant alongside his role as lecturer at the University of Wolverhampton. Mark’s experience of delivering S&C services to elite athletes has included working with several Olympic sporting programmes within the UK high performance system, including GB Triathlon, GB canoeing, GB Water Polo and British cycling. 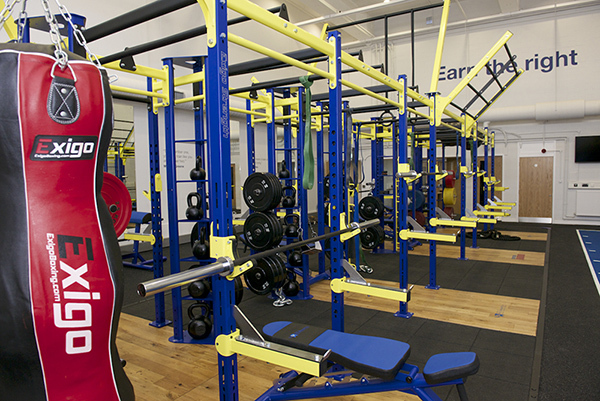 Currently he delivers S&C support to athletes from a range of sports, including triathlon, golf and rugby. You can find more information about the Institute of Sport and Human Science staff research on our Research Centre for Sport Exercise & Performance webpage. Access to fantastic specialist study and sports facilities. As a graduate you will be very employable. In the most recent annual national Destinations of Leavers from Higher Education (DLHE) Survey, over 99% of our Sport graduates reported that they were in in work or further study six months after they had left university. You will have access to our fantastic ‘Career Development Week’. During this week you will have the opportunity to gain additional vocational qualifications at a heavily subsidised cost. Work placement opportunities and the Wolverhampton Enterprise and Employability Award are embedded in all of the Undergraduate Degrees within the Institute. Free set of Sport kit from our official suppliers, Under Armour. Represent your university as part of Team Wolverhampton. Could you be a future winner of one our Sports Awards? Apply for one of our Sports Scholarships worth up to £4,500. Gain ‘real world’ experience through some of our exciting partnerships, such as our work with Walsall Football Club. Free gym membership for students in Halls of Residence. Take part in our Social Sport programme. If you have some qualifications and experience in football coaching, there are opportunities to take a year out as part of our Pass it Forward initiative with West Bromwich Albion Football Club. You will be based on the Walsall Campus which is the home of one of our partners, British Judo. The Government’s ‘Sporting Future’ strategy identified that sport and physical activity is central to life in the UK. It has the power to transform people’s wellbeing and create a fitter, healthier and happier nation. The transformative power of sport has never been more important as the growing levels of health problems and conditions associated with physical inactivity cost the nation over £7 billion each year. Sport and physical activity also contributes approximately £40 billion to the UK economy each year, with one million people employed in the sport and physical activity sectors. As a graduate of the BSc (Hons) Strength & Conditioning degree you will be able to apply the knowledge, practical skills, and industry qualifications you have gained in many of the areas above. The course will prepare you to work in the developing Strength and Conditioning industry, which continues to gain recognition in the UK. There are an increasing number of Strength and Conditioning roles within high performance sport, and with the majority of sports looking at Long Term Athlete Development, there are also many opportunities for Strength and Conditioning coaches to work across the spectrum at all ages and levels of performance. It will also prepare you for working in the private and public sector health & fitness industry. The BSc (Hons) in Strength & Conditioning will also prepare you for UK Strength & Conditioning Association (UKSCA) accreditation, should you choose to pursue this. Other career options include areas such as coaching, sports development, leisure management, sports performance, teaching and postgraduate study. The Institute of Sport works with a number of organisations to maximise sport performance, such as local professional football clubs and British Judo. These organisations offer various volunteering, placement and employment opportunities for suitable students/graduates studying BSc (Hons) Strength & Conditioning. The BSc (Hons) Strength & Conditioning is accredited by Skills Active/Register of Exercise Professionals (REPs), and completion of aspects of the course allows you to gain REPS qualifications in addition to your degree. REPs is an independent, public register which recognises the qualifications and expertise of exercise instructors in the UK. REPs provides a system of regulation for instructors and trainers to ensure that they meet the health and fitness industry’s agreed National Occupational Standards. This provides assurance and confidence to the public and employers that all professionals on the Register are appropriately qualified and have the knowledge, competence and skills to perform their role effectively. On completion of the BSc (Hons) Exercise and Health you will therefore benefit from both a degree, and additional qualifications that are recognised within the health and fitness industry. Entry to this course requires a Disclosure and Barring Service (DBS) Check. If you have accepted a Conditional Offer made by the University of Wolverhampton you will receive correspondence asking you to complete an enhanced Disclosure and Barring Service (DBS) check. The charge for this will be a DBS fee of £44.00 and a £6.00 ID check service fee. You will also need to complete a physical activity readiness questionnaire prior to starting the course.